Four restaurants that provide a reliable home for the island’s cuisine, starting with The Latin Pig. Cuban food is not easy to find in Dallas. Cuban restaurants are not clustered into neighborhoods, but scattered. And yet it’s worth seeking out the food from an island that soaks up influences—Spanish, Caribbean, and African. You can find places with traditional charm, tucked away like the island’s paladares, restaurants opened in people’s houses. Havana good meal: If you’re new to Cuban cuisine, order the entrée sampler at The Latin Pig, which comes with ground beef picadillo, stewed chicken, and slow-roasted pork. Then enjoy it amid turquoise booths and classic Cuban imagery. The Latin Pig feels like one of these, with a mother’s cooking, a warm ambience, and a menu of Cuban dishes with a few from Puerto Rico. Ana Castillo Guerrero and John Guerrero opened their first spot in 2013 and a second location in The Colony earlier this year, where they stretched out with a vast and airy footprint, clear-glass chandeliers, and a well-stocked bar. But it’s comforting to come to the original in Plano, where alcohol is BYOB, booths surprise with turquoise upholstery, and brushed cement walls hold images of Old Havana’s guava-pink and faded peach Spanish colonial façades, fedora-wearing men nursing cigars, and 1950s automobiles. Families pass around appetizer platters of thick yucca fries—craggy on the outside, snowy white at the center—to dip in mojo sauce or double-fried tostones, fat disks made of smashed green plantains. Eat them while they’re hot. If it’s your first time, you’ll want to order an entrée sampler for a taste of the cuisine’s beautiful melding. The ground beef picadillo is studded and livened with peas, carrots, and green olives, though no raisins. The spices are gentle. Tender stewed chicken gives itself over to its sauce with relaxed generosity. Some nights a mound of lechon (slow-roasted pork) will have crispy skin. Others not, missing the balance of the tender, fatty, and crispy that makes it the showstopping centerpiece it can be. 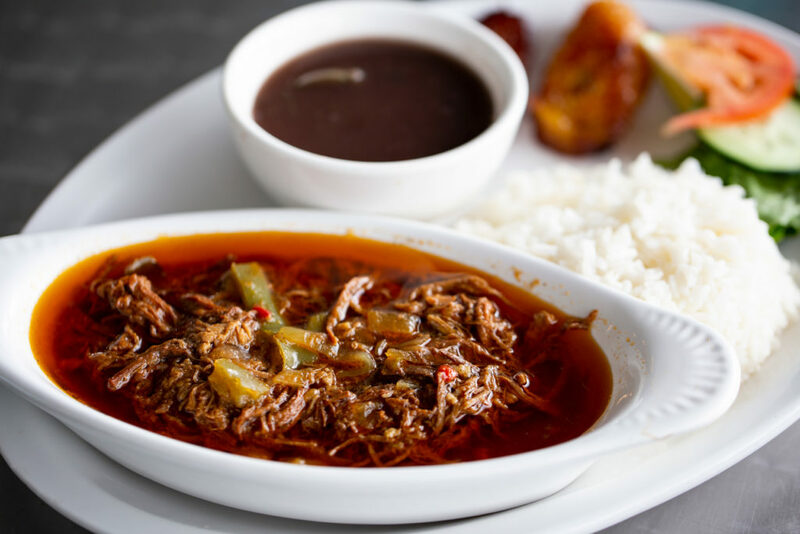 Lanky strips of ropa vieja can be on the dry side and stringy. But the crowning glory among entrées is camarones al ajillo (garlic shrimp), best with a dome of fluffy white rice. The garlicky sauce forms an apricot-colored sunset pooling under melting red and yellow bell peppers. One bite sends you to the coast, to sandy beaches and brilliant turquoise sea. End with coffee and pastelitos. The decision is already made: you have judiciously saved room for the flaky, house-made turnovers that hold guava jelly and cream cheese, which ooze out in tandem, like a pleasant secret you want to spill. Sisters Rita and Sara Vasquez own the quaint Cuban Dulceria International Bakery & Cafe, which has been in the family since their parents, Dalia and Rene, founded it in 1979. (It now has two locations, both in Carrollton.) Glass cake plates and sepia-toned family photos create an air of nostalgia. Theirs is a spot for a strong, sweet cafe Cubano or a cortadito with its cap of steamed milk, for a media noche sandwich or a ham croquette with béchamel. In the pastry case, on doilies and cut-glass trays, are capuchinos, spongecakes soaked in rum syrup; meringues sandwiching dulce de leche; and flaky coconut or guava jelly and cheese turnovers with golden puff pastry. The sisters’ wistfulness for Cuba comes out in cream-filled, caramel-lacquered horns and coconut macaroons, the sweets that make the island sing. Spread out a newspaper and scatter it daintily with crumbs and drops of guava jelly. 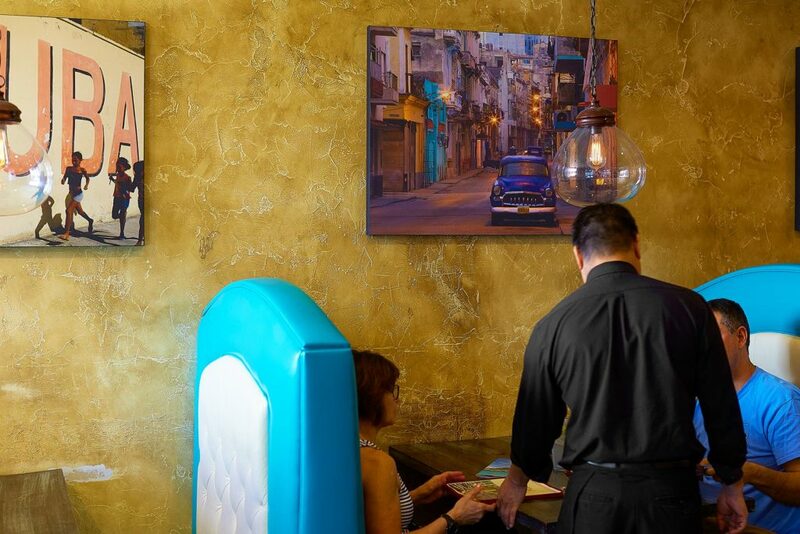 Anthony Alvarez—born in Key West, where his Cuban grandfather rolled cigars—opened a tiny spot in Bishop Arts reminiscent of the ventanita walk-up windows of Miami. What the staff hands to you through a side door are some of the best yucca fries in town: thin, ethereally crispy, and dusted with chile salt. 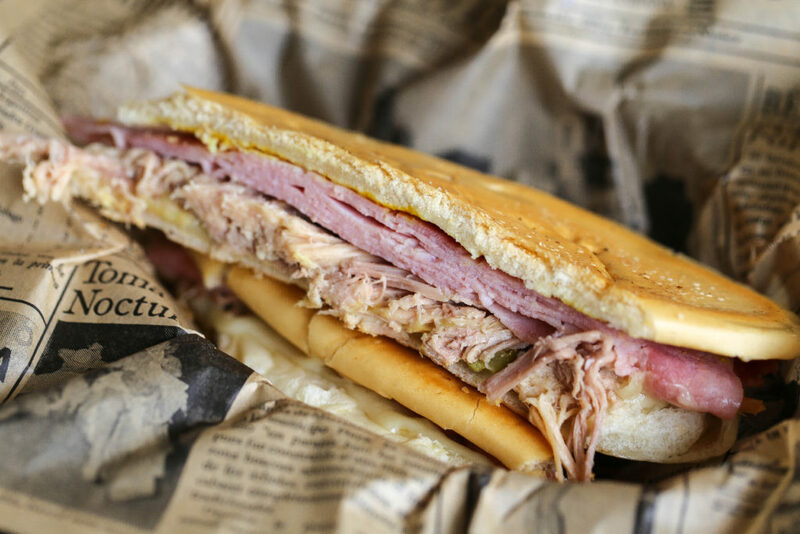 The Cubano, grilled on the flattop, is a tender pile of melted Swiss cheese, ham, pickles, and pork that’s slow-cooked until it’s fall-apart tender, marinated in a mojo piqued with sour orange. There’s a Cuban take on a burger, a beef and chorizo patty spiked with adobo ketchup on media noche (a slightly sweet egg bread). A version of the Elena Ruz, a sandwich of roasted mojo turkey and cream cheese, is named after a well-heeled Havana socialite, the improbable strawberry jam here replaced with homemade jalapeño jelly. Or get the flavors of Cuba in a taco loaded with tender ropa vieja. But no order is complete without yucca fries.